Acute inflammation is an immediate response to injury or infection, which is part of innate immunity. · Cardinal signs of inflammation include rubor (redness); calor (heat); tumor (swelling); dolor (pain); functio laesa (loss of function). The important components of acute inflammation are hemodynamic changes, neu-trophils, and chemical mediators. · Chemical mediators of increased permeability include vasoactive amines (histamine and serotonin), bradykinin (an end-product of the kinin cas-cade), leukotrienes (e.g., LTC4, LTD4, LTE4). · The mechanism of increased vascular permeability involves endothelial cell and pericyte contraction; direct endothelial cell injury; and leuko-cyte injury of endothelium. · Primary (azurophilic) granules contain myeloperoxidase, phospholipase A2, lysozyme (damages bacterial cell walls by catalyzing hydrolysis of 1,4-beta-linkages), and acid hydrolases. Also present are elastase, defensins (microbicidal peptides active against many gram-negative and gram-positive bacteria, fungi, and enveloped viruses), and bactericidal permeability increasing protein (BPI). · Secondary (specific) granules contain phospholipase A2, lysozyme, leukocyte alkaline phosphatase (LAP), collagenase, lactoferrin (chelates iron), and vita-min B12-binding proteins. · Macrophages (life span in tissue compartment is 60–120 days) have acidhydrolases, elastase, and collagenase. Neutrophil margination and adhesion.Adhesion is mediated by complementarymolecules on the surface of neutrophils and endothelium. · In step 1, the endothelial cells at sites of inflammation have increased expres-sion of E-selectin and P-selectin. 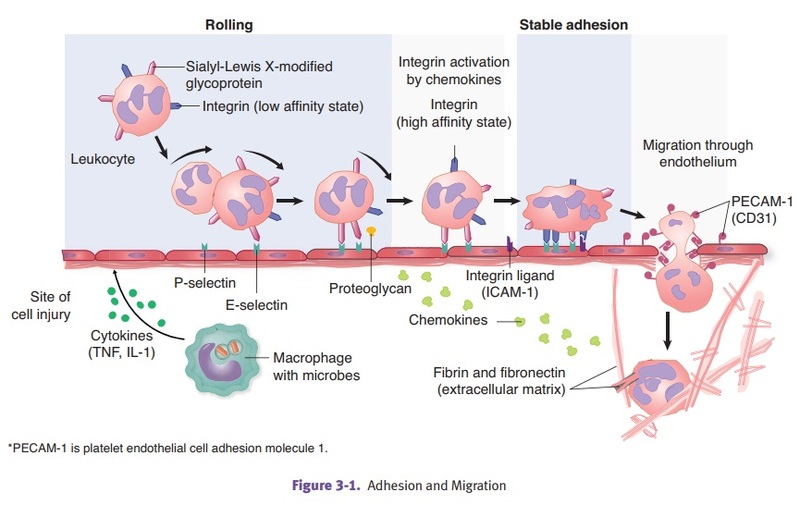 · In step 2, neutrophils weakly bind to the endothelial selectins and roll along the surface. · In step 3, neutrophils are stimulated by chemokines to express their integrins. · In step 4, binding of the integrins to cellular adhesion molecules (ICAM-1 and VCAM-1) allows the neutrophils to firmly adhere to the endothelial cell. Modulation of adhesion molecules in inflammation occurs as follows. The fast-est step involves redistribution of adhesion molecules to the surface; for example, P-selectin is normally present in the Weibel-Palade bodies of endothelial cells and can be mobilized to the cell surface by exposure to inflammatory mediators such as histamine and thrombin. · Additionally, synthesis of adhesion molecules occurs. For example, proinflam-matory cytokines IL-1 and TNF induce production of E-selectin, ICAM-1, and VCAM-1 in endothelial cells. · There can also be increased binding affinity, as when chemotactic agents cause a conformational change in the leukocyte integrin LFA-1, which is converted to a high-affinity binding state. Defects in adhesion can be seen in diabetes mellitus, corticosteroid use, acute alcohol intoxication, and leukocyte adhesion deficiency (autosomal recessive condition with recurrent bacterial infections). In emigration (diapedesis), leukocytes emigrate from the vasculature (postcapil-lary venule) by extending pseudopods between the endothelial cells. They then move between the endothelial cells, migrating through the basement membrane toward the inflammatory stimulus. Chemotaxis is the attraction of cells toward a chemical mediator that is releasedin the area of inflammation. Important chemotactic factors for neutrophils include bacterial products such as N-formyl-methionine and host derived molecules such as leukotriene B4 (LTB4), complement system product C5a, and α-chemokines (IL-8). Phagocytosis and degranulation.Opsonins coat microbes to enhance their detec-tion and phagocytosis. Important opsonins include the Fc portion of IgG isotypes, complement system product C3b, and plasma proteins such as collectins (which bind to bacterial cell walls). Engulfment occurs when the neutrophil sends out cytoplasmic processes that sur-round the bacteria. The bacteria are then internalized within a phagosome. The phagosome fuses with lysosomes (degranulation). Defects in phagocytosis and degranulation include Chédiak-Higashi syndrome, an autosomal recessive condition characterized by neutropenia. The neutrophils have giant granules (lysosomes) and there is a defect in chemotaxis and degranulation. In oxygen-dependent killing, respiratory burst requires oxygen and NADPHoxidase and produces superoxide, hydroxyl radicals, and hydrogen peroxide. Myeloperoxidase requires hydrogen peroxide and halide (Cl–) and produces HOCl (hypochlorous acid). Oxygen-independent killing involves lysozyme, lactoferrin, acid hydrolases, bac-tericidal permeability increasing protein (BPI), and defensins. · Chronic granulomatous disease of childhood can be X-linked or autosomal recessive. It is characterized by a deficiency of NADPH oxidase, lack of super-oxide and hydrogen peroxide, and recurrent bacterial infections with catalase-positive organisms (S. aureus). The nitroblue tetrazolium test will be negative. · Myeloperoxidase deficiency is an autosomal recessive condition characterized by infections with Candida. In contrast to chronic granulomatous disease, the nitroblue tetrazolium test will be positive. · Histamine is produced by basophils, platelets, and mast cells. It causes vaso-dilation and increased vascular permeability. Triggers for release include IgE-mediated mast cell reactions, physical injury, anaphylatoxins (C3a and C5a), and cytokines (IL-1). · Serotonin is produced by platelets and causes vasodilation and increased vas-cular permeability. · Thromboxane A2 is produced by platelets and causes vasoconstriction and platelet aggregation. · Prostacyclin (PGI2) is produced by vascular endothelium and causes vasodilation and inhibition of platelet aggregation. · Prostaglandin E2 causes pain. · Prostaglandins PGE2, PGD2, and PGF2 cause vasodilatation. Leukotriene B4 (LTB4) causes neutrophil chemotaxis, while leukotriene C4, D4, E4 cause vasoconstriction. Lipoxins are antiinflammatory products which inhibit neutrophil chemotaxis. Important products in the complement cascade include C5b-C9 (membrane attackcomplex), C3a,C5a (anaphylatoxins stimulate the release of histamine), C5a (leuko-cyte chemotactic factor), and C3b (opsonin for phagocytosis). · IL-1 and TNF cause fever and induce acute phase reactants; enhance adhe-sion molecules; and stimulate and activate fibroblasts, endothelial cells, and neutrophils. · IL-8 is a neutrophil chemoattractant produced by macrophages.